Travis loves Candace’s joyful smile and she can’t get over his blue eyes. You can see both captured in the image above! Candace & Travis contacted me looking for a photographer they could trust to produce beautiful, personal photos that would tell their story. Several friends introduced Candace to my work– a sorority sister, a photographer who has been my lighting assistant on a few shoots, and a friend from Penn State College of Nursing. Candace had been following my blog for over a year before we met and was super-excited for her own photography session! Candice & Travis love the outdoors– they hike, bike, kayak & even trained for the Marine Corps Marathon together! They also enjoy visiting charming, historic destinations and are planning an elegant, vintage inspired wedding. I suggested Omni Bedford Springs Resort for their engagement photography location and was thrilled when they agreed that it was the perfect fit! 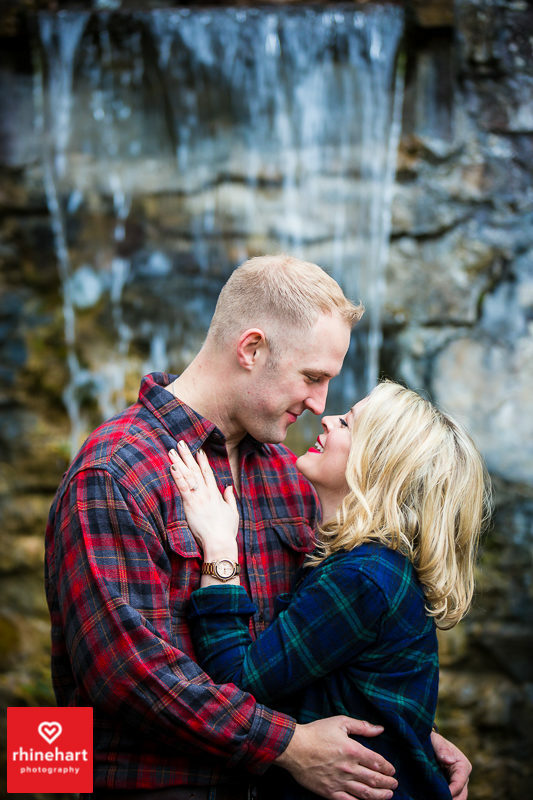 There were so many incredible settings there and the engagement session really only touched on a few– here is a waterfall at the Iron Spring Wedding Grotto. Candace and Travis arrived several hours before the session and enjoyed lunch together at the resort. Travis explored the grounds while Candace had her hair and make-up done onsite at the Springs Eternal Spa. What a fun day out! Candace and Travis originally met in middle school and dated through high school and college. You can tell that friendship is at the core of their relationship– they have a deep respect for each other and are up for anything together. Travis shared that he is continually impressed with Candace’s ability to achieve anything she puts her mind to. She is smart and incredibly driven and that has always attracted him to her. Together they are able to challenge each other, support each other and push their own boundaries. Team work is the name of the game for these two. We moved from the expansive grounds to the exquisite indoors of the Omni Bedford Springs Resort for a wardrobe change and to capture a bit of the beautiful interior as well. The staircases are impressive to say the least. I like the perspective of this image and the way the lines lead your eye down to the place where Candace & Travis are standing together. Their pool is absolutely stunning and one of the first indoor pools constructed in the United States. In the early 1900s, musicians would serenade swimmers from the opera box that you can see above the happy couple. I love using natural light in my photography. I also enjoy capturing candid emotion in a beautiful setting from a creative perspective. For those reasons, this is one of my favorite images from this engagement session. I just love the atrium, it is so unique! Candace and Travis, thank you for sharing your afternoon with me! It was such a pleasure to get to work with you and know the two of you better! I’m so happy to have introduced you to the Omni Bedford Springs Resort and am thrilled to hear that you can’t wait to go back. I feel the same way– maybe I’ll see you there ;).